The Texas Stars played the Charlotte Checkers last night and came away with a 4-0 win after pounding the Checkers' net with 50 shots. Jussi Rynnas got the shutout in net for the Stars, fending off 34 shots including 2 penalty shots. It was a tough, physical game that resulted in several brawls in the third period with lots of penalty minutes being doled out. 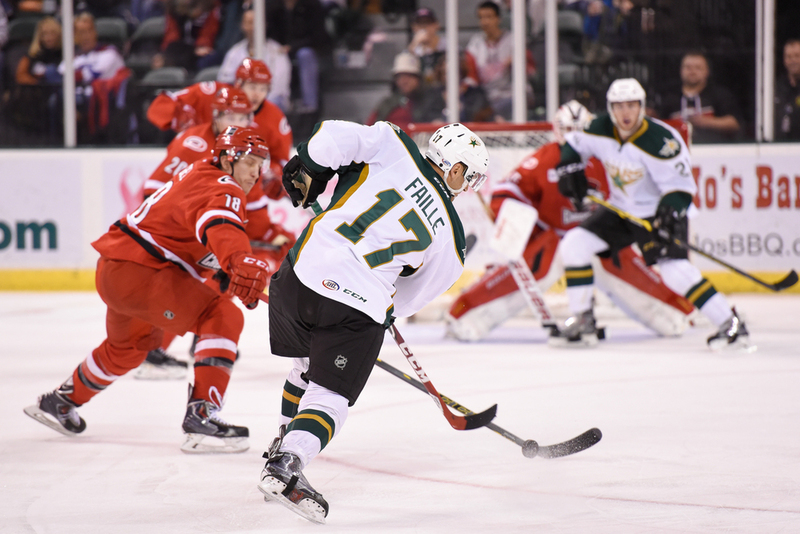 The first shot catches the puck coming off the stick of Eric Faille toward the Checkers net. The puck cleared the defensemen's stick but wouldn't make it into the net. The second shot is representative of the highly physical game. Scott Valentine takes down a Checkers player as he races for the puck. The third shot illustrates the tremendous net minding and defense of the Stars as they prevent the Checkers from getting on the scoreboard in the last couple minutes of play. A brawl erupted following this play which resulted in Julius Honka leaving the ice for fighting and a Checkers' player getting ejected for a misconduct.